After letting my premium cable stations - y'know, HBO, Cinemax, Showtime, etc. - leave my home, I have turned my movie watching to DVDs. By doing this, I am seeing a mixture of 1) films I always wanted to see, 2) movies that I heard good things about and 3) movies I take a chance on. The romantic comedy "Love Actually" fits in the second category. I heard good things about it but being the skeptic I am, read the DVD box to make sure the film would be OK.
Part of the box read: "The recently elected British Prime Minister (Lou Grant) is handsome and single, and he runs into Natalie (Martine McCutcheon), a new junior member of the household staff at 10 Downing Street..."
Ahoy, I thought, this would be acceptable viewing. I've always liked Lou Grant, and I definitely prefer romantic comedies to, say, mindless action-adventure goulash. But here is why I am a bit upset: I have discovered that DVD cases often lie. Not only do they describe their films in the best possible way, but they sometimes have factual information wrong. In the case of "Love Actually," Lou Grant does not play the British Prime Minister. Rather, Hugh Grant plays the Prime Minister. Despite this factual woe, I watched the film anyway, enjoyed it to a certain extent but pondered what could have been with the right actor playing the Prime Minister. 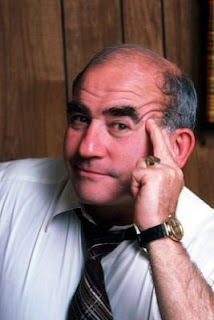 A friend told me, "Lou Grant? He's not even an actor. That's just a character from the Mary Tyler Moore Show. You misread the box." I consider myself a strong reader and find it hard to believe that I misread the box. Where are all the literary icons?